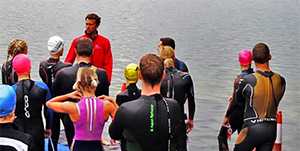 Richard and his team of experienced swimming and triathlon coaches provide open water swim tuition from their base at Bray Lake Watersports in Maidenhead. Richard and the team of outstanding coaches have all been working together to bring you the best open water coaching available. One to one coaching is ideal for novices seeking some additional assistance in acclimatising to the open water environment and learning the essential open water swim skills. » Vaseline or Slip Stick to avoid wetsuit rash! Richard Stannard aka ‘The Shark’ or ‘The Fish’ is a seven time World Champion in multi-sport and led the elite triathlon world out of the water for over a decade. Originally a swimmer Richard had a career as an elite triathlete for over 15 years. Richard has the ability to coach any level of swimmer from the complete beginner to the pro athlete.